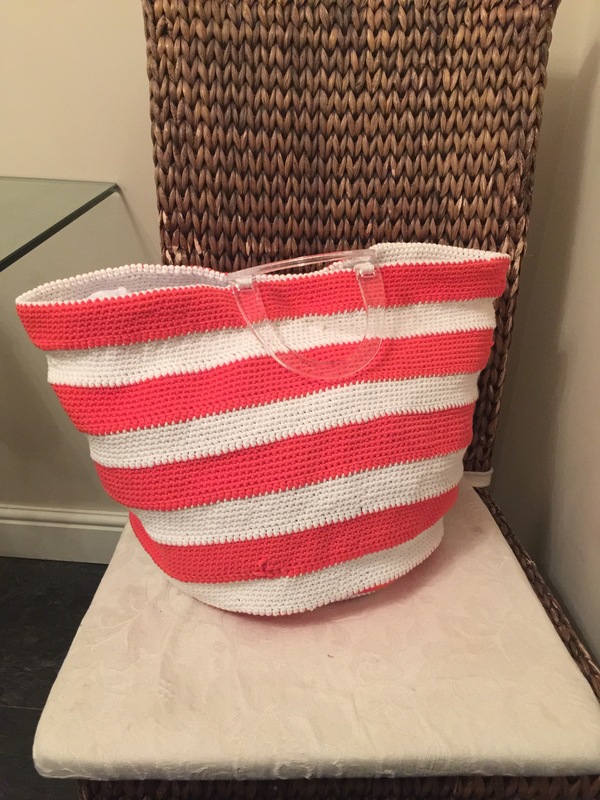 I’ve finally finished a beach bag I’ve been working on for ages!!! A good friend is off to Dubai for her holiday on Tuesday and it’s her birthday tomorrow, originally I had offered to make her a beach cover up using James c Brett noodle. I completed one for my daughter first and to be honest I didn’t like it, it wasn’t the best yarn to use, and I didn’t want to go to too much effort in making it if my friend wasn’t going to use it. 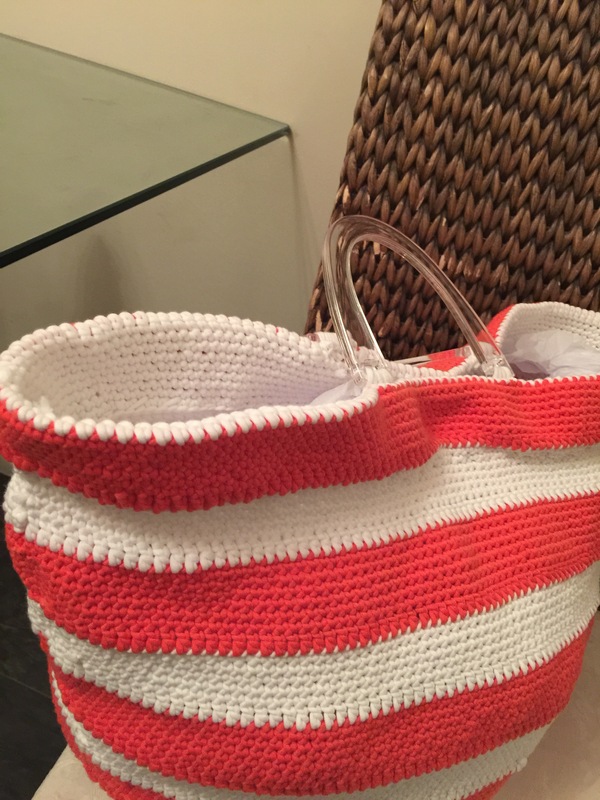 James c Brett noodle has a tubular feel to it, but when crocheted it’s quite sturdy, so I thought I’d make her a beach bag instead, I think she’ll get more use out if it and it’s a better use for the yarn, she chose orange…….anyway I’ve finally finished all 102 rounds! I’m pleased with it, there’s the odd blemish where the end of the noodle is visible but only a little, I don’t care anyway it adds to the character of the bag, that’s my excuse anyway!!! I’ve stitched a popper/press stud sin yo the top so it closes easily and some nice clear handles, I quite pleased with it actually! Now let’s hope she likes it!!! 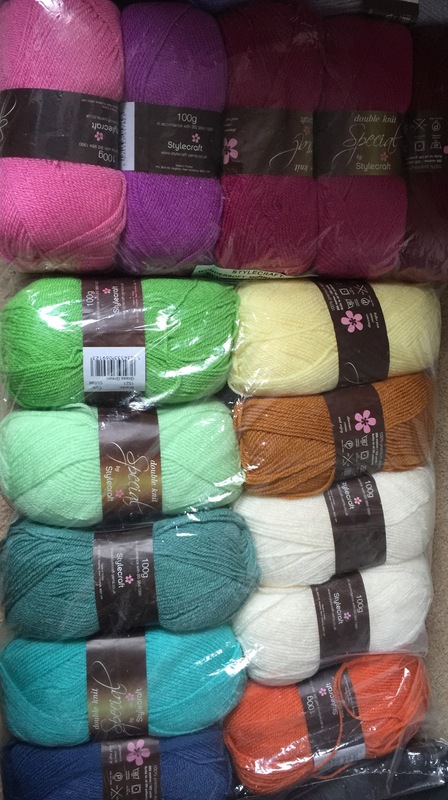 My yarn arrived for sue pinners carousel blanket, hubby was in the car with my as yodel were driving out of the close, he said ‘what the bloody hell gave you ordered now? !’ I denied all knowledge, luckily I’ve trained my daughter well and she took the parcel and stashed for me 😂 it’ll stay there until 13th September! I’m not 100% sure if the colours, but hopefully it will turn out as it looks on the advertisement for it! She will love it!!!! I like how we all hide our yarn from our hubby’s. Never have more yarn than you can hide is my motto! Wanted you to know I am addicted to CALs as well. 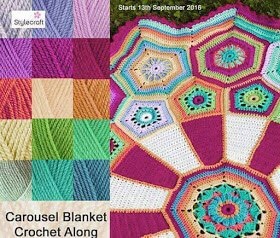 Just ordered the carousel yarn pack and I will be joining you! I am not great at color choices either and ordered the kit from Love Crochet. I am currently working on the Mandala Madness. This CAL has ended but the pattern is still there. You would love it. Very different style called Crochet overlay which I had never done before. I am also working on the peacock tail bag CAL that started August 17 and the Demelza Blanket that started yesterday. It’s a very nice bag!